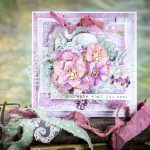 Spellbinder’s dies are wonderful for die-cutting so many different materials. We especially love the warm texture of felt and how beautiful it is when die cut. Designer Julia Stainton created this beautiful vintage style card with felt die cuts to embellish this design. This project features the Hearts and Flowers die templates from the Sapphire line. The card project measures 5.25″ x 5.25. Create 5.25″x5.25″ card base from white cardstock. Adhere 5″x5″ layer of mint patterned paper to card front. Adhere 4.5″x4.5″layer of light blue patterned paper to card front. Adhere 4″x4″ layer of pink dot patterned paper to card front. Stitch around layers with sewing machine if desired. Using Hearts and Flowers doily die template, die cut four felt shapes (2 from white felt, 1 from mint felt, 1 from aqua felt). Using Hearts and Flowers Leaf dies, die cut felt leaves from teal felt (2 from each leaf shape). 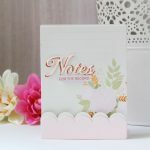 Adhere felt doilies and leaves in a grid pattern on card front. Adhere various embellishments over leaves and doily layers to add to the look. Adhere A Gilded Life Diamond accents as desired. 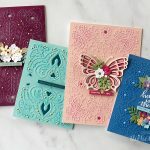 Try die cutting felt or other materials with your Spellbinders dies to get unique and varied looks. It’s always amazing how you can get unique looks with the same dies.